DSB sold its cargo division DSB Gods to the German state railways DB. DB created a joint venture with Swedish Green cargo, which was initially called Railion Scandinavia, then DB Schenker Rail Scandinavia and then DB Cargo Scandinavia. This joint venture took over almost all of DSB's electric locomotives and also many shunter diesels. 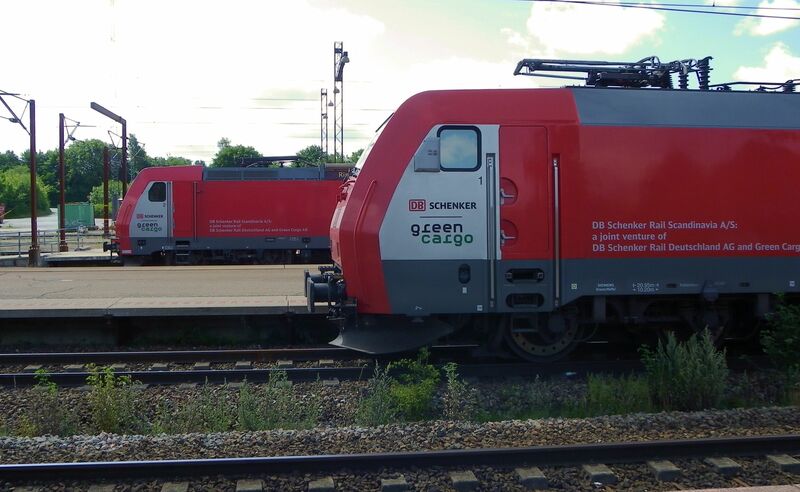 In 2019 the joint venture was broken down and the locomotives and carriages were split between DB Cargo and Green Cargo, which now both operate in Denmark as competitors. Today there is very little rail cargo left in Denmark, except for the Germany - Odense - Copenhagen - Sweden route, where also many private companies compete with DB Cargo and Green Cargo. 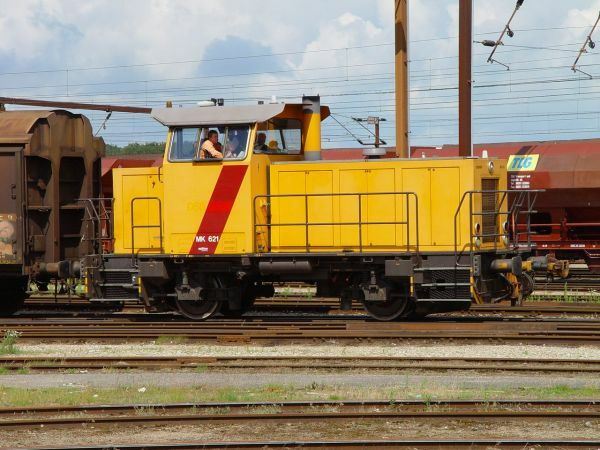 This locomotive is a class EG six axle electric locomotive from the years 1999-2001. 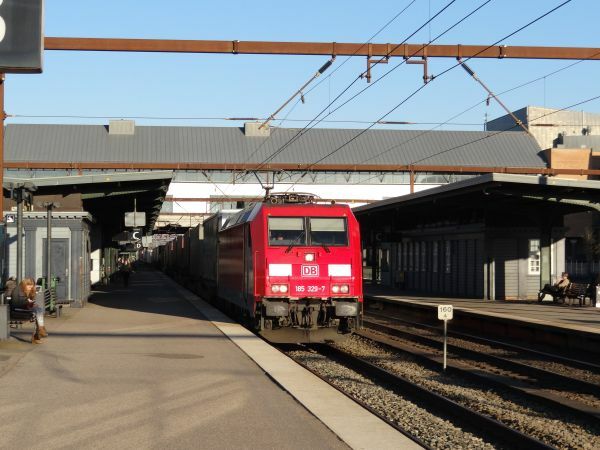 It is based on the German cargo locomotive class 152 and Siemens' prototype EuroSprinter locomotive. However, unlike those, EG has six axles. It can run both on Danish 25 kV AC as well as German/Swedish 15 kV AC. Six axles are needed, because the fixed line connection from Germany via Denmark to Sweden goes in many places under the sea with very steep ramps, so that exceptionally powerful machines are needed. Picture of this class EG was taken 8.7.2016 in Kolding by Ilkka Siissalo. 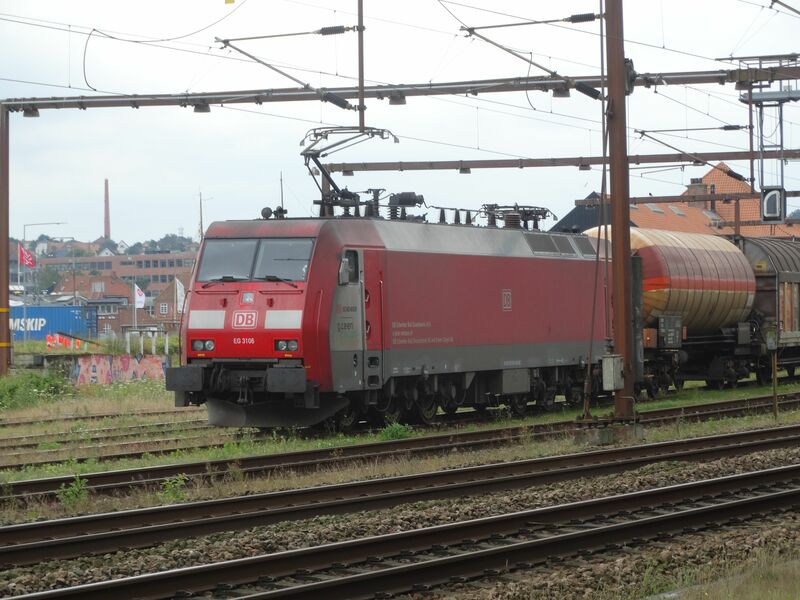 A German multiple electric system Bombardier TRAXX of the German class 185.300, but owned by DB Cargo Scandinavia. 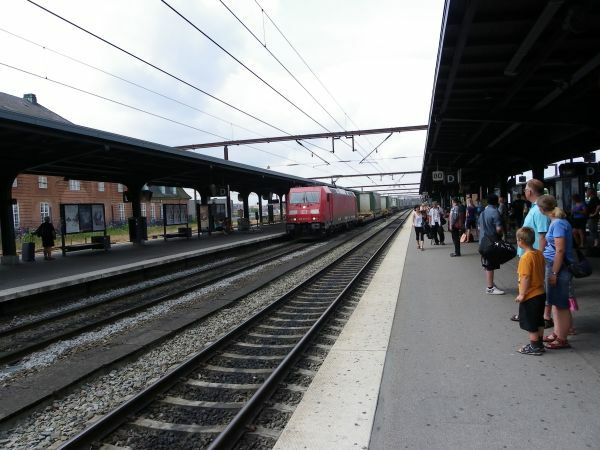 This and the class EG pictured above are today the most common cargo locomotives in Denmark. Picture from Odense station 12.3.2014 by Ilkka Siissalo. 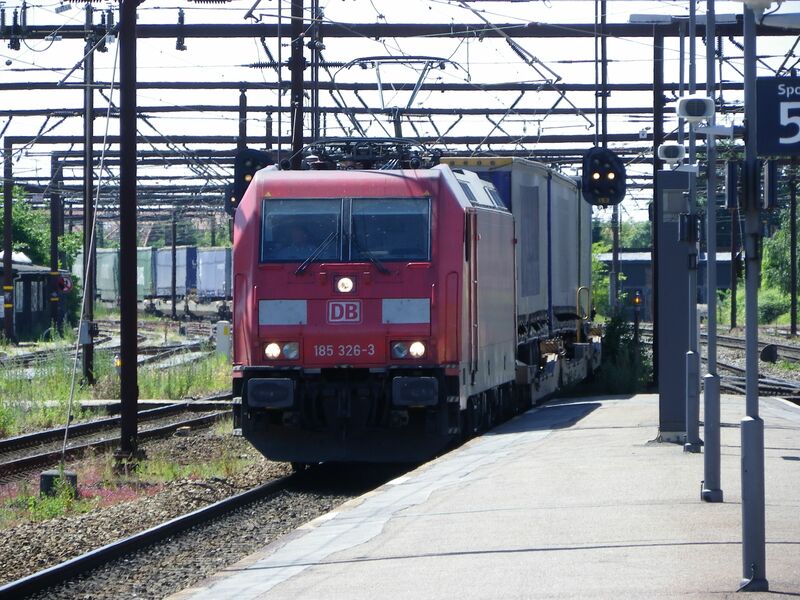 A Bombardier TRAXX of the German class 185.3xx of DB Schenker Rail Scandinavia is here in full speed hauling a "Rollende Landstrasse" (rolling road) service of lorry trailers from the south through Roskilde station and towards Copenhagen. The class 185.3xx are second generation multiple electric system TRAXXes specifically fitted to be able to run in Germany, Denmark, Sweden and Norway. Picture from Roskilde 1.7.2010 by Ilkka Siissalo. 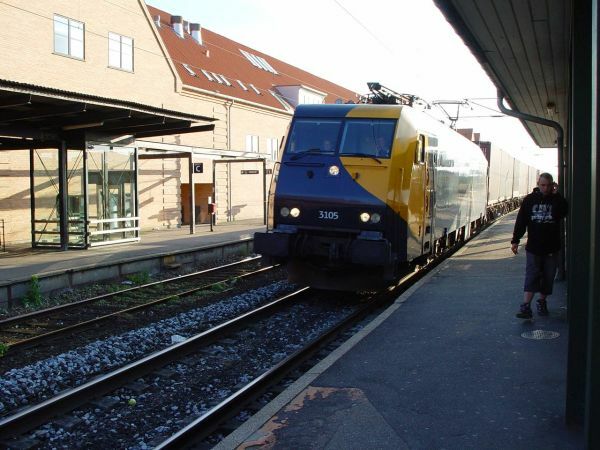 Just moments after taking the picture shown above, a similar "Rollende Landstrasse" service rolled though Roskilde, but this time coming from the north and heading south. Now the locomotive was not a TRAXX but a six axle class EG still in DSB's blue and yellow tapings. It took DB several years to repaint all of these locomotives to their own colours and now that the joint venture has been broken, some of them appear in Green Cargo's green livery. Another Rollende Lanstrasse service in full speed and with a class EG electric locomotive still with the blue and yellow tapings of DSB Gods. Picture from Slagelse 2.7.2004 by Ilkka Siissalo. 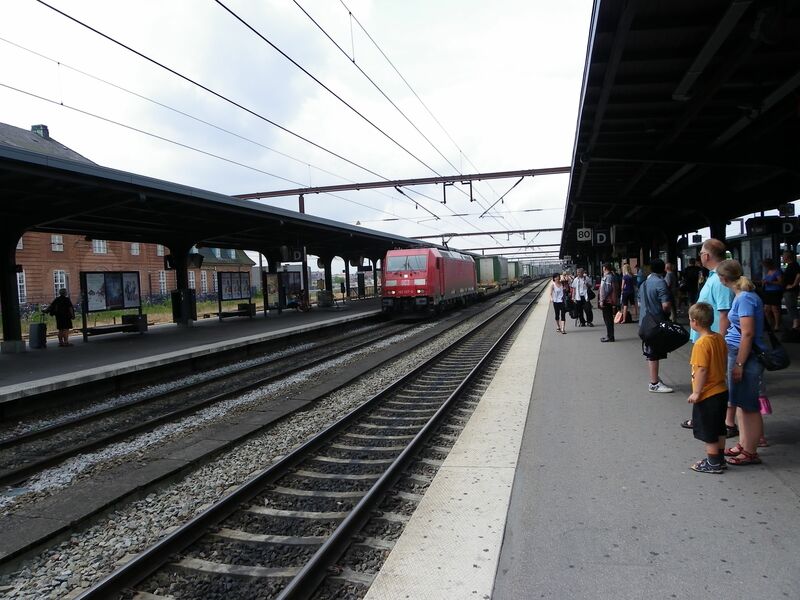 Yet another "Rollende Landstrasse" service, this time coming from Germany and rolling through the station of Korsør. The locomotive again is a Bombardier TRAXX of the series Br 185.3xx. Picture from Korsør 22.7.2010 by Ilkka Siissalo. At first they look identical, but they are not. 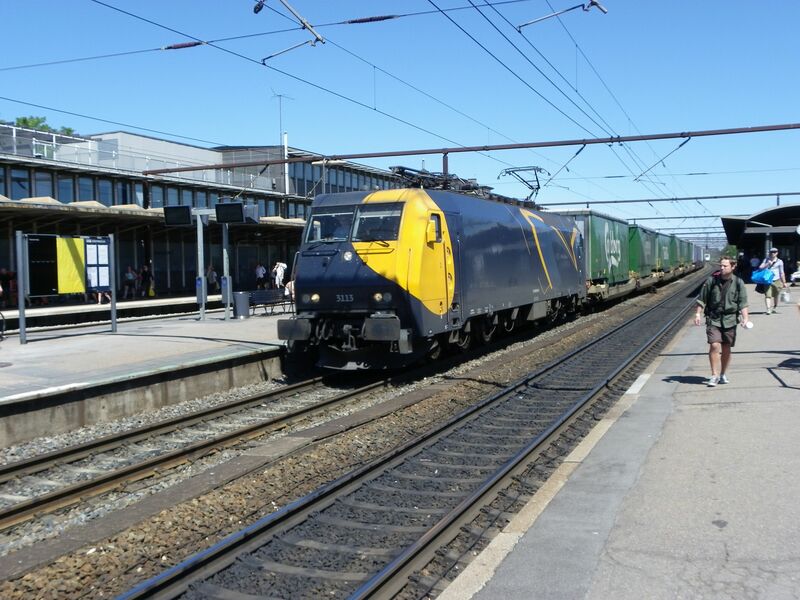 The one in front is a six axle class EG whereas the one in the back is a four axle class 185, both in the colours of the former joint venture DB Schenker Rail Scandinavia. It's immediately clear that these two are close relatives, but the EG is older and was built by a consortium including Siemens, ADtranz and others, whereas the class 185 was built by Bombardier, which bought some of ADtranz' factories after the insolvency of ADtranz. Picture from Ringsted 12.7.2011 by Ilkka Siissalo. A class MK shunter diesel of DB Cargo Scandinavia. These were built 1996-97 by Siemens in Kiel, Germany (later MaK). 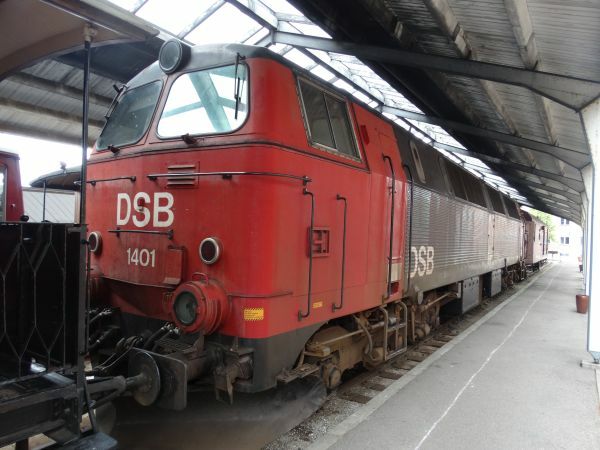 DSB Gods originally had 20 of them, but some have now been sold to Germany. Picture from Kolding 8.7.2016 by Ilkka Siissalo. 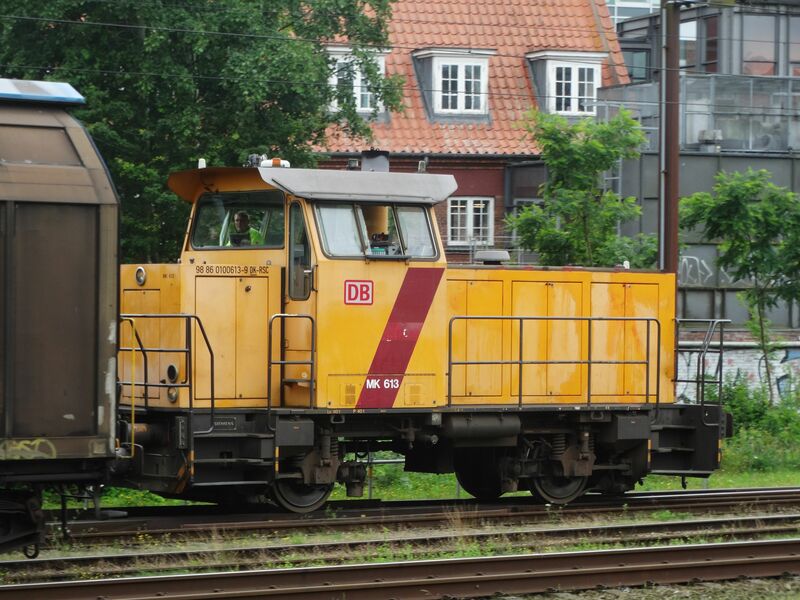 Another class MK shunter, this time in Odense in 2004 and still without DB's markings. Picture from Odense 3.7.2004 by Ilkka Siissalo. A class MZ six axle General Motors diesel made by Nohab in Sweden. This one is still in the old colours of DSB Gods. They were built 1977-78 and are thereby already quite old, but DB Cargo still has some of them in active use. Many were sold to Norway and Sweden. 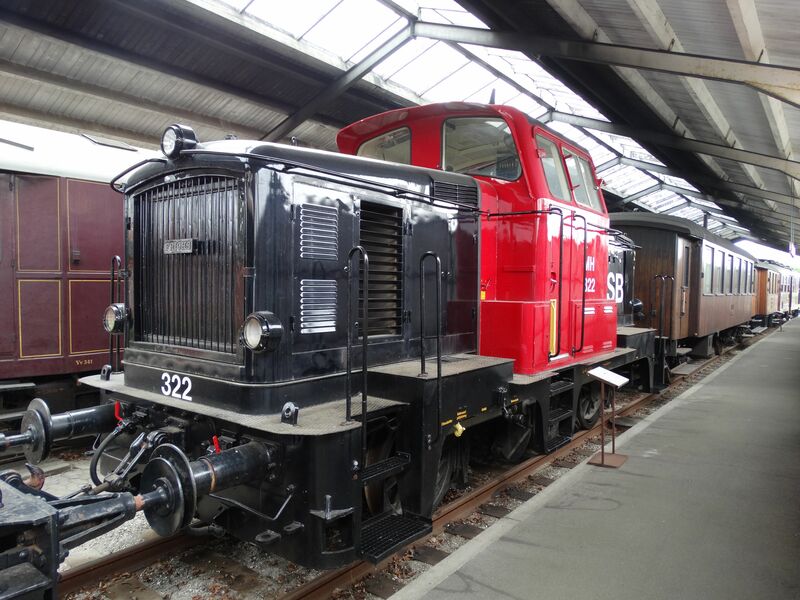 This one was photographed at the Danish railway museum in Odense 10.7.2016 by Ilkka Siissalo. 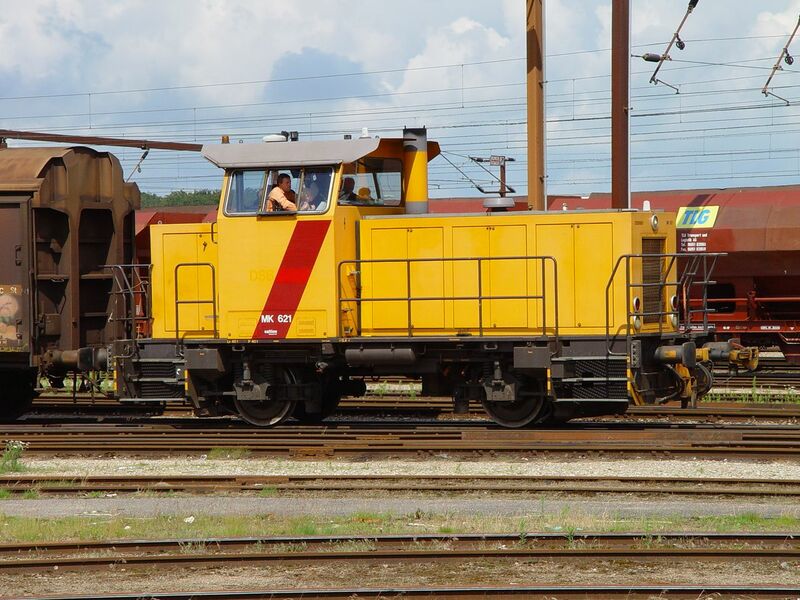 A class MH shunter. Frichs built altogether 120 of these 1960-65 on license, based on a type of Henschel of Germany. The last one was taken out of service in 2001. Picture from the Danish railway museum in Odense 10.7.2016 by Ilkka Siissalo.